'WordPress For Beginners In 3 Easy Steps' is a newbie guide that lays out in complete detail the exact steps needed to build a full-fledged website. We will start building a website from scratch and then add layer upon layer of WordPress goodness! Note: This book is part of the 'Stoked About WordPress' series. We won't just talk theory but also use 50+ screenshots and a demo website to point to live examples! Pick the best domain names and web hosting using my checklist. Buy web hosting at a super discount! By the end of this step your website will go live on the world wide web. Woot! Learn how to make essential back-end tweaks to lay a strong foundation for your WordPress website. Add content, graphics, sidebar widgets, social media icons, plugins, customized navigation bar to your site. Pick up some juicy SEO tips! Use the SEO checklist and image SEO techniques for a perfectly on-page optimized WordPress website. By the end of Step 2, you would have turned a basic WordPress installation into a full-fledged website! Step3 - The Design: Let loose those creative juices and overhaul your website into a new level of design. WordPress web design isn't only for pros! We will work with an amazing free theme that will give you a tremendous level of control over your site's design. Down to the very last pixel. Well, almost! Change your website's design in minutes with a few clicks. No coding needed! By the end of this step your WordPress website will be totally set for prime time! 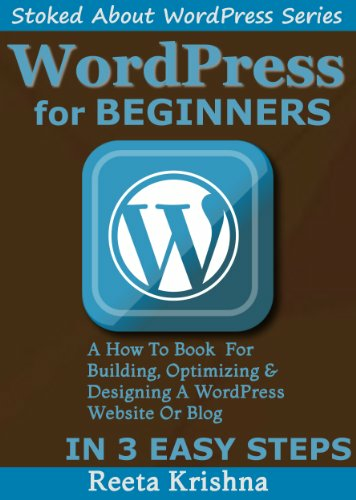 "WordPress For Beginners In 3 Easy Steps" has a detailed Table of Contents; please scroll up and take a "Look Inside" the book!